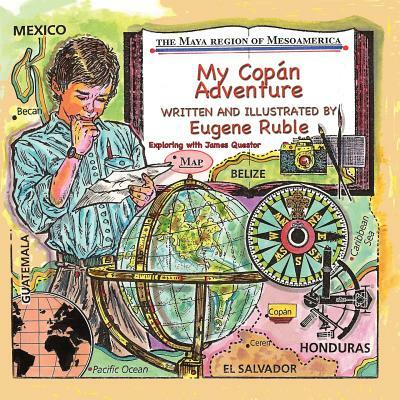 Explore the ancient world of the ruins of Copán with twelve-year-old James and his father, Professor Questor, in My Copán Adventure written and illustrated by Eugene Ruble. James is excited when his father tells him he will be his assistant on the next expedition Professor Questor makes. They will be traveling to the ancient Mayán city of Copán to try and determine what happened to its people. While there, they study temples and hieroglyphics. They talk about stelaes and pyramids. James takes photos and draws sketches so they can take their information back home and interpret the data. My Copán Adventure is a beautifully illustrated book that introduces young readers to the lives of the first people to arrive in the Copán valley about 2300 years ago. Readers follow James and his father on their journey through the ruins, with Professor Questor sharing his wealth of knowledge about the Mayáns and their ancient civilization and answering James’s questions along the way. The Lil Diva (10) just finished studying this ancient civilization in school, so she truly enjoyed reading the book with me. My Copán Adventure could be used to supplement school learning or in a homeschooling program. It offers a fun and interesting way to learn more about the Mayáns and their culture. What I found most interesting is the author’s note, which makes mention of some of the hypotheses scientists have formed about the fall of the Copán dynasty. One of the ideas is that the destruction of their forests by overbuilding and depleting their natural resources had an impact on their survival. This helps young readers to make the connection between ancient times and their modern world. This is definitely a book I’m glad to have as part of my daughters’ library. I received a PDF version of this book directly from the publisher in exchange for my honest opinion. Guardian Angel Publishing also released my first book and Eugene Ruble illustrated it. I received no monetary compensation for providing this review.